This contest is now closed. Congrats to our winners: Tim Kearn and Kyle Wilfong! Lancashire doom monsters, Evil Blizzard unleashed one hell of a twisted freak show when on June 9th they dropped their brand new album The Worst Show On Earth via Crackedankles Records! This new eight-track studio recording is the group’s third and sees them jumping through fiery hoops to produce some downright maddening music. While the masks and lunacy remain the same, this time they’ve broadened their sound beyond the psyche, krautrock and post-punk for which they’re known. You can still expect a heavy, ugly and uneasy listen, but the music’s now also been augmented with guitar, cello, samples and even industrial elements. With UK tour dates spread all over the remainder of 2018, not to mention some festival appearances such as at Beatherder, Sonic Rock Solstice and Jesstival, the guys will be sharing this new tunage far and wide. With the album limited to 500 copies on premium weight blood splattered vinyl, we’re stoked to be offering this rad giveaway of The Worst Show On Earth! 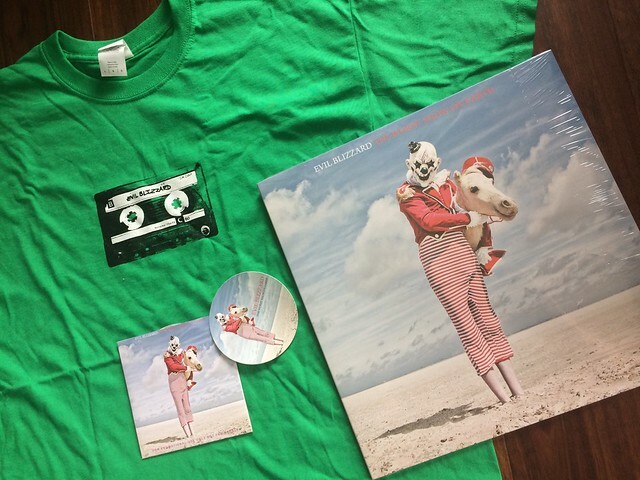 TWO (2) fortunate fans will each get a free copy of Evil Blizzard’s brand new album, The Worst Show On Earth, on both vinyl and CD as well as a T-shirt and stickers! Fill out the form below to enter and be sure to "Like" the PureGrainAudio Facebook page, and share the post, for extra chances to win! Check out the band’s first track on the new album "Hello".